Where to Buy Segment II Herbicide, Segment II Herbicide Vantage Sethoxydim - 2.5 Gallons - $684.95 for Sale with Fast Free Shipping! 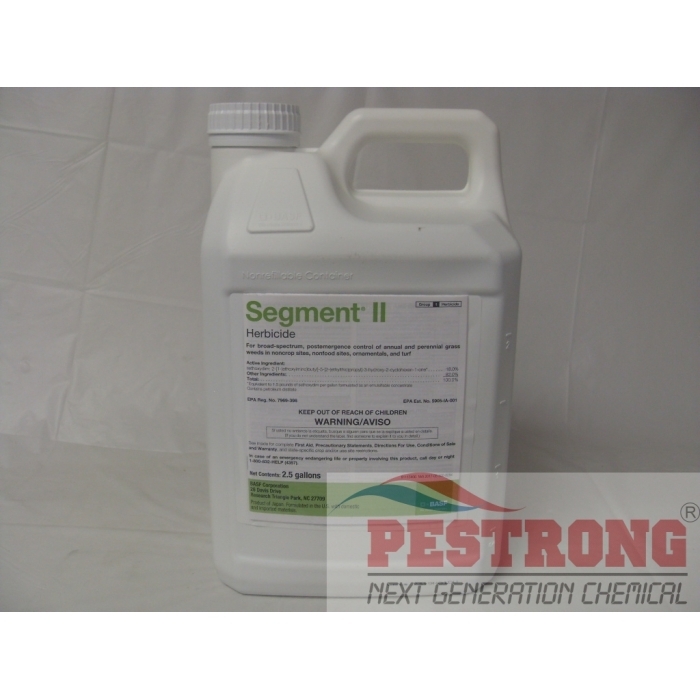 Segment II Herbicide Vantage Sethoxydim - 2.5 Gallons is a selective broad spectrum, post emergence herbicide for control of annual and perennial grass weeds in ornamentals, nonfood, noncrop sites, and turf. By buying this product & leave product review you can collect normally 68 reward points as a voucher of $6.80(1%). This is improved version (18% Sethoxydim) of previous Segment Herbicide (13% Sethoxydim) by same manufacturer with new label. Grass Killer rapidly enters the targeted grass weed through its foliage adn translocates throughout the plant. The effects range from slowing or stopping growth (generally within 2 days), to foliage reddening brunback occurs. USE ON: Turf areas, most ornamentals, nonfood areas, and noncrop sites. CONTROLS: Many perennial and annual grasses including Annual Ryegass, Bahiagrass, Bermudagrass, Crabgrasses, Goosegrass, and others. I have a stiltgrass infestation and the local invasive weed specialists recommend either glyphosate or sethoxydim. The infestation is in a wooded area that I'm trying to restore, so I preferred to avoid the "scorched earth" approach of glyphosate although the sethoxydim is about ten times as expensive. Sethoxydim doesn't produce noticeable results as quickly as glyphosate, but it does eventually kill the stiltgrass without harming most other plants. I found it also works well on johnsongrass. Easy to mix and use.